“Scientists have made significant progress in the design of vital components used in hydrogen fuel cell vehicles. Improved features will lower production costs and help create a clean automotive future. With hybrid and all-electric battery-powered cars now becoming mainstream, hydrogen’s importance as a versatile, clean and safe energy carrier is increasingly recognised. Although its use in transport is gaining momentum, the current market share of fuel cell electric vehicles (FCEVs) is small due to high costs and efficiency problems. A group of experts is addressing this challenge as part of the EU-funded INN-BALANCE project. They have recently specified the interfaces between the crucial components of the FCEV technology to improve their design. The ongoing INN-BALANCE (INNovative Cost Improvements for BALANCE of Plant Components of Automotive PEMFC Systems) project also proposes an “integrated injector/ejector solution.” This will maximise the power output from the stack while minimising hydrogen losses. PEMFC stands for proton exchange membrane (PEM) fuel cell, also called polymer electrolyte membrane fuel cell. It’s a type of acid-based fuel cell that uses the transport of protons from the anode to the cathode through a solid PEM. These fuel cells run at temperatures below 100 °C. Anode and cathode are the two electrodes in a battery or fuel cell, where the former is positively charged and the latter is negatively charged during electricity generation. Most fuel cells designed for use in vehicles produce less than 1.16 volts of electricity – far from enough to power a vehicle. 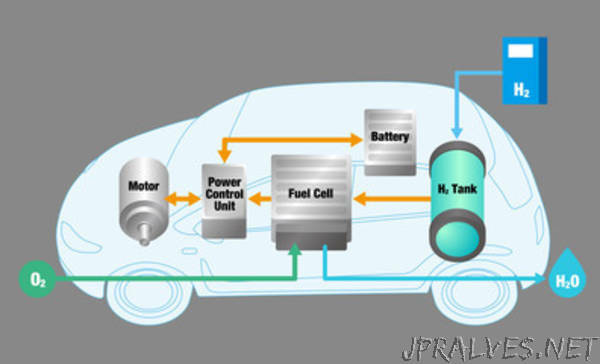 Therefore, multiple cells must be assembled in a fuel cell stack.